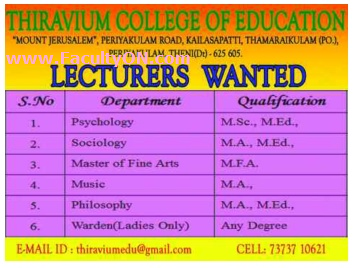 Thiravium College of Education, Theni has advertised in the DINAMALAR newspaper for recruitment of Lecturers jobs vacancies. Interested and eligible job aspirants are requested to apply as soon as possible from 08th April 2018. Check out further more details below. About College: Thiravium Group of Institutions, named after the beloved father of our Chairman is run by Trinity Trust. The institutions are situated on a verdant evergreen hilly toact area. It is a very conducive environment for education. Thiravium Group of Institutions consist of five colleges. A Teacher Training Institute, A College of Education, A College of Nursing, A College of Arts and Science and A Paramedical College. ow to Apply: Interested candidates are requested to send their CV along with copies of certificates and recent passport size photo to the postal address / email address provided below.